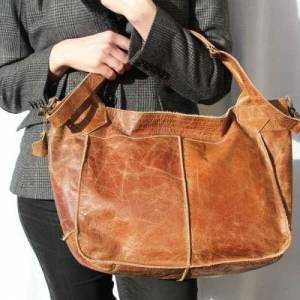 Gertrude is an extremely versatile dark tan scrunchy leather tote bag converting from Tote to Overnight to Elbow to Shoulder to Cross-body leather bag. The width of this bag is 53cms, height is 32 and depth is 18. The base area of the bag measures 40 x 18 and the weight is 1kg. The outer pocket measures 45cms by 15cms. This bag has 3 different handles two of which are removable and the longest handle is adjustable from 70 to 132cms, the shoulder handle is plaited and soft and even removable and is 45cms long for total comfort. The external pocket measures 45x15cms, the internal zip is 18 by 15cms, and the last two internal open patch pockets measure 6x12 cms and 13.5X12. This bag is so versatile, from shoulder, to elbow to cross-body. It’s roomy, light, yet durable. 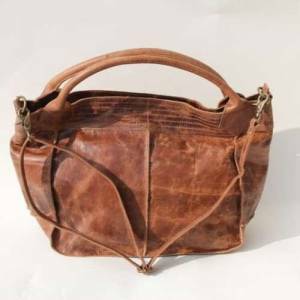 A really amazing bag. Bach Medium Tote Tan Scrunchy LeatherThis large odilynch rea..
Bach Medium Tote Tan crunchy LeatherThis large odilynch real..